Our new online shop has arrived and the first six patterns are available for purchase. More patterns will be added in due course. PinBroidery is part of the Form-A-Lines Stitching Cards group and offers the same reliable and secure service. 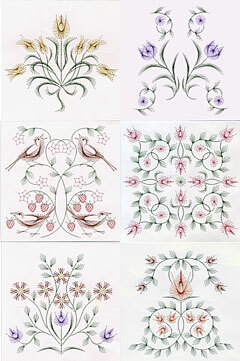 This flower designs on the new patterns were inspired by the work of William Morris. He was a nineteenth century English architect, furniture and textile designer, artist and writer associated with the English Arts and Crafts Movement. It would make a beautiful card for birthdays, congratulations and other special occasions. These PinBroidery patterns have more detail than a typical Form-A-lines pattern. I estimate that they will take about twice as long to stitch. I would be interested in any feedback on the time they take. Give us your thoughts in a comment to this post. This entry was posted in PinBroidery and tagged PinBroidery on Thursday 2 April 2009 by David Jefferson. How did PinBroidery get its name? We were looking for an exclusive word that sums up the prick and stitch method of making greetings cards. A pin is used to prick out the pattern and embroidery techniques are used to stitch the design. A natural progression from this led us to PinBroidery. Unfortunately it is a word that is easy to misspell as Pinbroidary, Pinbrodery, Pinbrodary or Pinbroderie. To make sure people will find us we have registered the .com versions of each of these spellings. How do you like our choice of name? Let us know in a comment to this message. This entry was posted in PinBroidery and tagged PinBroidery on Saturday 14 February 2009 by David Jefferson.